Spiders can be very persistent and can constitute a nuisance very easily. You walk into a room and invisible strands of webs snag your hair and face. Leave this unattended and within a short while your home will look like a haunted house. Many folks look for ways to treat or avoid this scourge. Some go looking for a natural spider repellent that will keep the spiders away. Those who are already suffering from a spider infestation try to get a natural spider killer or spray to exterminate these pests. Whether you are looking to prevent the entry of these pests or trying to kill off those that have already come in, getting the best spider repellent can be a very helpful thing. Most times, what we call a repellent is usually a spider spray that can both kill existing spiders and also prevent the entry of new ones. The best spider sprays out there will do both jobs perfectly. However, before investing in spider sprays, it may be ideal to first try a natural spider deterrent. One of the things that can help reduce spiders in your home is the absence of flies, insects, and ants which is what the spiders feed on. If you can ensure their meals are not available in your home, you make your home unattractive to them. A few tips for achieving this include ensuring there are no open leftover foods. Store foods in sealable containers. Close up cracks in the wall where ants and insects can hide. Clean up after every meal, ensuring that no crumbs and spills are left behind. After doing all of these and you still have these spiders, you can then look for the best spider sprays to help you get rid of the pests. When choosing a spider spray, there are a few things you should consider to help you easily decide on which is best for you. Some of the factors to consider include Chemical or natural, target insects, the durability of treatment, size, odor, and toxicity. With many folks now worried about the use of chemical pesticides, it is important to decide if you want to go for a product made of all-natural ingredients or if you won’t mind products made of chemicals. Many spider sprays made of all-natural ingredients are supposed to be safe for humans. This means you can use them where there are humans and pets without fear of any toxic contents getting into their systems. Those made from chemicals are however not safe for humans and may require that the treated area be vacated for a while. Many insist that the residue left behind still constitute some health hazard to users. Some users, on the other hand, do not believe the all-natural products are really effective. They believe they are too mild to really get the job done. Before making your decision, ensure you carefully read through the documentation and maybe check out what other users are saying about the product so you can choose one that will serve you well. The fact that you want to treat a spider infestation may not necessarily mean that spiders are the only pests on your property. Having a product that does not only kill and repel spiders but also kills and repels other common home pests may be a better deal. It will really be a waste or an inconvenience to have to get one treatment for spiders, another for cockroaches, another for mosquitoes etc. If it is possible to get one that can get all these pests exterminated (and it is), then that should be a better choice. It, however, all comes down to your personal choice. If you just want to deal with the spiders, then, by all means, go for the spider spray that kills only spiders. No one really wants to have to treat their homes every so often. Before making your choice, find out how long the treatment stays active. This will give you an idea of how often you will need to treat your home to stay spider free. The size of the spider spray will determine if it will be sufficient for your use. It may be more economical to get a spider spray that offers more volume so you can treat a wider area without having to get multiple cans. Some spider sprays are odorless or possess negligible scents. Try to ensure you know if what you are choosing has any odor. Spider sprays with strong odors are more inconveniencing as you may need to vacate the treated area for a while. In some cases, you may have to deal with the odor for a few days. Be sure you know what you are getting into so you can at least plan appropriately. You may just need to get a gas mask or else go for a different product. This is a major concern for many of those who are not bothered by spider sprays made of chemicals. Many manufacturers are trying hard to reduce the level of toxicity of their products. That said, some products still possess high toxicity levels. Knowing how safe or dangerous a product is to your health will help you know whether to get it at all and if you do get it, will help you decide how to use it. You may decide to use it and leave the treated area for some days. At least, knowing will help you make an informed decision. There you have it. We have quickly looked at some factors you may need to consider when choosing spider sprays. 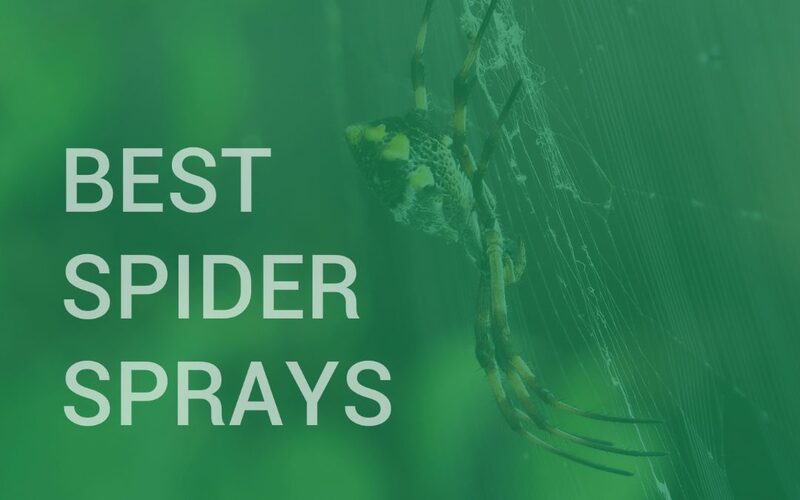 It’s now time to help you further by taking you through our pick of 10 top quality spider sprays. As you join us on this review, do watch out for any product that meets your requirements. Net volume: 32 fl. oz. Other features: Made from all natural ingredients; no toxic chemicals. Disheartened by her dog’s devastating health condition which was a side effect of a flea and tick treatment recommended by a vet, a condition which left the dog with pesticide poisoning (with symptoms which included seizures and even kidney and liver failures), Stephanie Boone, the founder of Wondercide Natural Products decided that she had to find a solution to ensure other pets and families do not have to go through what her pet and her family went through. Thus Wondercide was born. With a focus and determination that can only come from deep within, she and her company have succeeded in providing products that are natural, with absolutely no toxic contents. Products from Wondercide are made from all natural ingredients sourced in the U.S.A and made in the U.S.A. Every product from this brand is human-grade and very sustainable. They cause absolutely no harm to your kids or pets. They just get the job done without harm to anyone or the environment. 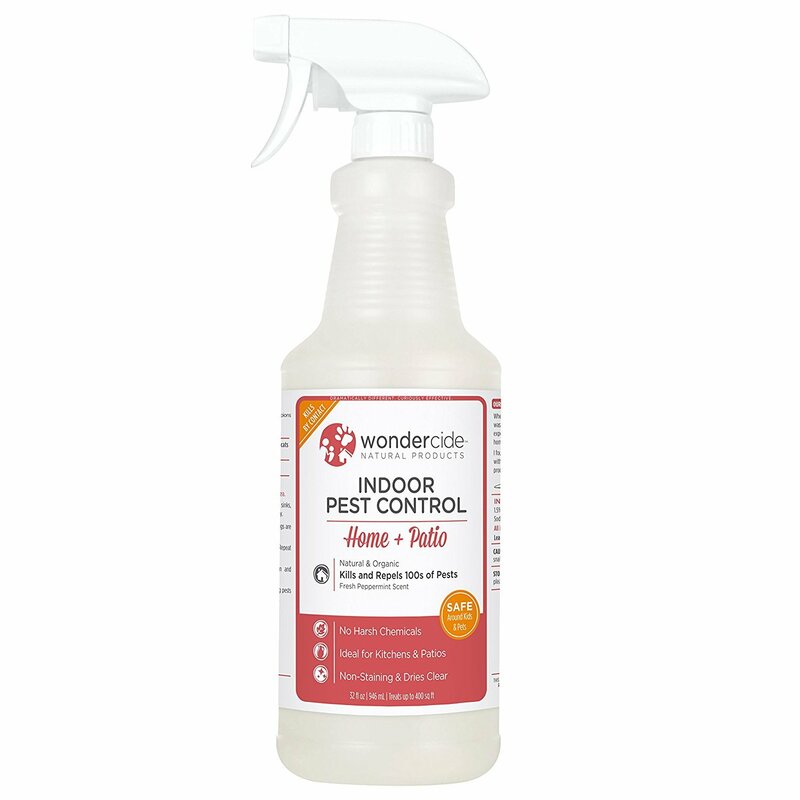 One such product from the brand is the Natural Indoor Pest Control spray. It is designed for home and patio use. It can also be used around the house but is not designed for use on plant life. Let’s amaze you some. This product is designed to kill and repel up to 100 different pests. This is not your regular spider repellent or spider spray. This is way more than that. Made from all natural ingredients, it is totally safe for humans and pets. It leaves your space with any of the four available lovely fragrances rather than toxic residues. This, however, does not mean it is not effective. Like we stated earlier, it will kill up to 100 different pests including mosquitoes, spiders, roaches, fleas, ticks, mites, scorpions and much more. That’s not all, it will also kill their eggs and larvae. Great, right? Simply spray on clothes, chairs, around doors, carpets, flooring, pet beddings, kitchen, pantry, furniture and more. You do not have to worry about your fabrics getting stained as it leaves no stains. For outdoor use, spray before or during your outdoor events and see how efficiently it will totally rid the environment of pests. You can treat a 2000 sq ft home or a 400 sq ft perimeter with one can of this pest control spray. Everything about this product is environmentally friendly. The ingredients are highly sustainable, the manufacturing process is low impact and the packaging is recyclable. Wondercide is so confident of this product that it offers a money-back guarantee on it. Bengal Chemicals is a brand that focuses on delivering various types of products for both industrial and home use. Bengal Chemicals has been in operation for over 100 years, offering homes around the world products that help them deal with different household issues ranging from pest control to hygiene and cleaning. Through the years, Bengal Chemicals has become a name that many have come to trust. It has continued to retain this trust while building more by maintaining the standard and quality of its many products. The name Bengal stands for quality, efficiency, and trust. Once you see that name on a product, you can expect nothing but the best from it. The Bengal Ant and Spider Killer is a case in point. 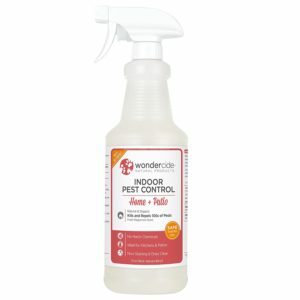 This is one product that offers complete control over ants and spiders. This can easily be called the best spider killer out there. It is easy to use and extremely effective. It does not just kill the spiders or ants, it continues to be active for up to 6 weeks. One user even said that the spray works for at least 6 weeks and that ever since they started using this product, he has seen no ants cross the threshold of his home. And another said that when they sprayed this product, no ants, spiders or others creepy bugs came even close to his home for up to 6 months time. Can you beat that? These are testimonials from real users and one thing runs through all them and that is that with this spray applied, ants and spiders stay away for a very long time even without a fresh spray. Some went as far as saying years. So, if you are looking for a spider killer spray, it’s now up to you to decide if this is the type of convenience you want to enjoy. Net volume: 24 fl. Oz. Ortho is a brand owned by Scotts Miracle-Gro Company, one of the largest providers of lawn and garden consumer products in the world. With over $2.6 billion in sales, over 12 brands in circulation, partnerships with over 5500 associates and more than 150 years in operation; this is one company that surely knows what it is about. It is committed to helping its customers create healthy and beautiful gardens. These products cover different special needs which include pest control. Ortho is one of its leading brands and is indeed making a real impact in its market space. The Ortho Home Defense MAX Insect Killer Spray is a leading pest control spray for homes everywhere. It is a spider killer, a roach killer, a mosquito killer and more. In fact, it boasts an impressive list of insects it can exterminate. These include ants, bees, beetles, centipedes, cockroaches, fleas, flies, grasshoppers, hornets, lace bugs, mealy bugs, midges, millipedes, mites, mole crickets, mosquitoes, moths, plant bugs, sawflies, scorpions, silverfish, spiders, stink bugs, thrips, ticks, termites, wasps, yellow jackets and a plethora of other bugs and insects. This spray comes in a ready to use can and immediately gets to work ridding your home and space of any or all of these pests and others you are not aware of. They do not just kill these pests, they create a barrier that keeps the treated area free of them for up to 12 months. That’s a full year of complete pest-free enjoyment. Not many other pest control sprays can offer you such efficiency. If you were simply searching for the best spider repellent, you have in this product that and more. Its ability to keep the treated area free of spiders and other pests for up to 12 months makes it one of the best spider sprays you can go for because you will be getting much more value than you were initially going for. This product offers you the option of indoor and outdoor use settings. If you want to use it outdoors as a perimeter treatment along the foundation of the building, choose the outdoor setting on the spray nozzle and spray at about 12 inches from the surface being treated. If you are using indoors, change the setting on the spray nozzle to indoor setting and spray the area that requires treatment, holding the nozzle about 12 inches away. It is best to clear the area of humans and pets during treatment, allowing them to return once the treatment has dried. If what you want is effectiveness and durability of treatment then this is one of the best spider spray options for you. SC Johnson, the owner of the Raid brand, is a well-known name in many homes across the world. Some of its very popular brands include Raid, Glade, Mr. Muscle, Pledge and many others. For over 100 years, it has made homes cleaner, fresher, smells more fragrant and free of pests. With each passing year, it has grown more committed to making the planet we live in a healthier and safer place, one home at a time. With products that improve cleanliness and healthy homes, families around the world can take control of their space, making it exactly what they want it to be. The Raid Max Spider and Scorpion Killer are designed to rid your home of the nuisance that spiders can constitute with their webs. It also rids your home of the more dangerous species of spiders like the black widow. In fact, it will kill over 30 species of spiders; of course, including the black widow. This is one of the best spider killers you can wish for especially with the range of species if covers. Aside from killing spiders, it will also kill scorpions. We know how dangerous scorpions can be and surely do not want them in our homes. This will kill any scorpion upon contact. As a bonus, this spray will also kill cockroaches and ants, making it very ideal for the home. We always say prevention is better than cure. 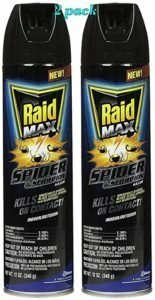 In this case, rather than continually killing after the pests have already come in, the Raid Max Spider and Scorpion Killer also offer a repellant feature. After killing those in the treated area, it prevents new ones from coming in. For easy application, it comes with an automatic trigger that is battery powered. This allows you apply the treatment without much strain and with uniform consistency. You can use it indoors and outdoors effectively. On porous surfaces, treat every 12 weeks to maintain its repellant feature. On non-porous surfaces, treat every seven weeks. This is a fantastic way of keeping your home free of spiders and scorpions. 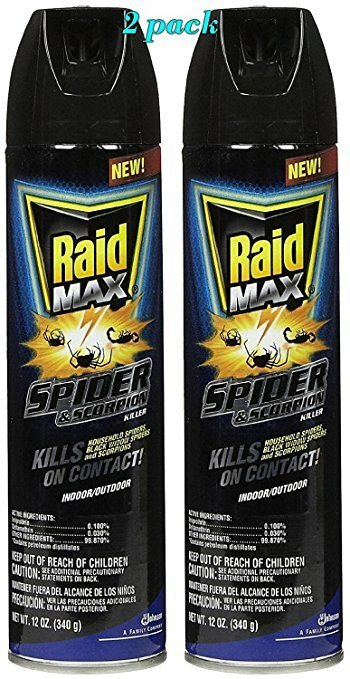 If you are searching for an outdoor or indoor spider repellent or killer, get the Raid Max Spider and Scorpion Killer and enjoy both killer and repellant features in one product. Don’t forget that you also get as a bonus a scorpion, cockroach and ant killer and repellant. This is another fantastic product from SC Johnson as the brand continues to fulfill its promise to the families of the world, supplying the products that help them keep their homes clean, healthy and fragrantly welcoming. Terro was first introduced in 1915 and it broke into the market with a top performance product. Since then, Terro had never relented on the level of quality in its products. Over a century later, Terro is still a leading brand in the insect pest control industry. This only goes to show the level of dedication Terro has to excellence. 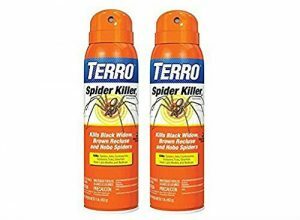 Staying relevant for that long is not something that can be done by just any company so if you need a brand you can rely on to help you rid your household of invading insects, Terro is an ideal go-to. When it comes to repelling and killing spiders, this indoor spider spray is the way to go. If you see a spider you want to kill, just spray this on it. Alternatively, if you know there are spiders in your home and you want to get rid of them all at once, just spray this all over the house. Especially in those cracks and crevices, you have seen them. 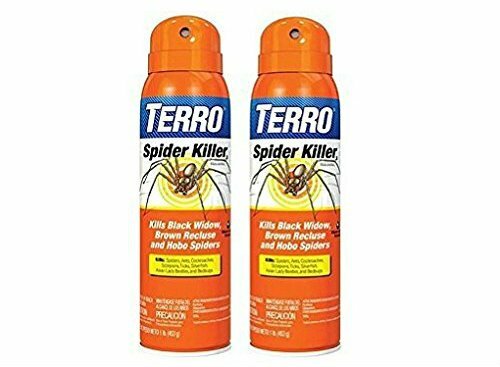 The TERRO T2302 Spider Killer Spray kills them on contact so it is not necessary you spray on them directly for it to work. This spider spray for the house will seek and destroy. No wonder it is considered one of the best spider killer sprays. The active ingredients in this product are Pyrethrin and Deltamethrin. Pyrethrin is an organic compound that attacks the nervous system of insects causing hyperactivity and eventually killing them. It is known to be very potent which is why it is popular in insecticides worldwide. Deltamethrin, on the other hand, is a synthetic pyrethroid which is also used for controlling domestic pest menace. So, with this product, you get double value for your money from the use of 2 potent insect killing compound. Next time anyone tells you that this product is the best indoor spider killer, don’t doubt it. Another great thing about this product is that its effects go beyond killing just spiders. It is highly effective against most other insects that might be invading your space. So, next time you go to the store to get insecticides, you don’t need to buy one for each insect. Just get this one and you’re good to start the eradication. As effective as it is, so it is easy to use. Just point it away from you and spray into the house; paying attention to the storage areas, drawers, baseboards, bookcases, and other areas you believe those pesky insects might be taking refuge. Spectrum Brands has quite a number of brands under its umbrella which includes Hot Shot, Baldwin, Russell Hobbs, Black+ Decker. Even if you never used a Hot Shot product before, chances are that you might have used at least one of the others. All the brands under this company are popular for making their customers happy and want to come back for more. Spectrum Brand ensures that no one brand performs any less than others. This is the type of consistency the company strives for, and this is the type of consistency you will get from Hot Shot products. The Hot Shot Spider & Scorpion Killer is one of such products with a rising consistency in quality. It is known to be one of the best spider repellents for homes so if you have spider and scorpion infestation in your home, this is a great way to get rid of them. Its active ingredients are Prallethrin and Lambda-Cyhalothrin. The prallethrin is a repellent insecticide which is used to control mosquitoes in households. This will help repel the unwanted visitors and you can also enjoy the side effects it will have on mosquitoes. The Lambda-Cyhalothrin is a synthetic insecticide that closely mimics the properties of the naturally occurring and highly potent pyrethrum. The bottom line is that this active ingredient is a ruthless assassin to spiders and scorpions. Whether it is the black widow or brown recluse spiders, they stand no chance against this product. As one of the best spider killers sprays for indoors, it is no surprise that it is effective against spiders and scorpions. But in addition, this spray will also kill dog ticks, crickets, and ants. The usage is quite simple as you just have to spray it around the house into cracks and crevices, baseboards, behind stoves and refrigerators, etc. You should shake well before spraying. To kill scorpions, you have to spray it directly on then, from a safe distance of course, and be sure to let the spray cover it up. Not only is this product good for indoors, it is one of the best outdoor spider repellents. To prevent spiders from entering your home, you can use it on the doors and the windows. This spray can also be used to treat lawns and turf. Talk about versatility. P. F. Harris is a popular company in the area of pest control. For many years, the company has been on top of its game and from the look of things, it does not plan on getting down. This is why it has been able to survive for so long and still remain relevant. The pursuit of excellence and consistency is what does the trick for this company. So, if you have been wondering what pest control manufacturer you can trust, here is your cue. The Harris Spider Killer is really what it is, a ruthless spider killer. Even the spiders will know something has changed once you get this product, so it would easily pass for a great spider control in the house. It uses an active ingredient called Deltamethrin, this is a synthetic pyrethroid which is known to be potent for killing insects. Black widow and brown recluse spiders will be killed instantly on contact. The formulation is so effective it has been reported to kill other insects as well. You just need to spray this around the house into dark corners, wall cracks, baseboards, behind the stove and fridge, etc. Once the spray has been applied, you might need to leave the vicinity so you don’t get to inhale the content. This spray will continue to kill spiders for hours after it has been applied. You don’t need to spray directly on the spider for it to work. Just spray into the house and leave it to get the job done. This spray is not oil based, so you don’t need to worry about stains and residues because there are none. It will not cause any stains on your furniture or walls. It does not have any odor so you won’t need to bother about your house smelling like a chemistry lab. This outdoor spider repellent is a great way to eliminate spiders from your home as you won’t even need to hunt them down. Once you spray this spider killer, as long as it comes in contact with the spiders, it will kill them. The spray nozzle has a nice splash that covers a good distance. You can still kill spiders if you are scared of them as you won’t need to get close to them. The far-reaching nozzle will cover the distance. Now you can play spider sniper. If you call this product an outdoor spider spray, you won’t be wrong at all because the Environmental Protection Agency certifies this spray for indoor and outdoor use. Target insects: Spiders, Silverfish, Roaches, Ants, Crickets, etc. On hearing the name of this company, you are sure it has confidence in itself and its products. Exterminator’s Choice is a company that is at the forefront of innovative pest control and management. It has several products that have proven to help with controlling pest infestation on different scales. Its innovative approach of not using toxic chemicals in its products makes it stand out from the rest. It uses all-natural ingredients in its pest repellents and deterrents. If you have been looking for the best spider killer spray for indoors, your search might come to an end. If you are looking for an effective insect repellent but are worried about those ones with toxic and harsh chemicals, your search has definitely come to an end. Not only is this product highly effective, it is totally safe too; safe enough to use where your kids and pets play. It is understandable to doubt that a potent insecticide is safe to use around kids. Most of the ones available are based on toxic insecticides and pesticides. Sure, they will kill and repel insects, but they are also hazardous to humans and animals. This product, on the other hand, uses organic active ingredients which are derived from plants and are not mixed with anything toxic. There are plants that have a defense system that protects them from getting eaten by insects and rodents. Extracts from these plants will continue to repel insects. And that method is what this product adopts. This insect spray is so effective it works to control many different types of bugs. Spiders that have been terrorizing you in your homes are in a certain kind of trouble as well as roaches, silverfish, ants, and many more other insects. If you are to choose between a chemical-based product and an all-natural alternative performing at the equal level of effectiveness, most people will go for the natural alternative. Not just because it is safe, but because it is environmentally responsible. This product will not in any way damage our ecosystem. Knowing that you are doing great for the environment while repelling pesky insects from your home will surely come with a good feeling. Now, this is a product you can feel good about. This spray is also available in a one-gallon container so you can extend the battle against insects. Since 1990 Web-Away has committed to manufacturing pest control products without the use of harsh chemicals. It is a company that is aware of the hazardous implications of those toxic chemicals. It believes that finding natural alternatives comes down to research. It put in the work and discovered natural ways to keep insects at bay, and effectively too. Its products are as potent as the ones that use chemicals. When a company cares about its customers’ well-being, such a good turn deserves another. The Web-Away Spider Eliminator is an ideal natural spider spray to take over control of your home. If spiders are left to roam free, before you know it, you will come back home one day and think you are in Count Dracula’s palace. Spiders make cobwebs, and if you allow them, they will spawn their web all over your home. This is why you need to get this spray and deal with them early enough. Once you see cobwebs anywhere in the house that is an indication of a spider’s presence. All you need to do is spray the area with this all-natural spray repellent. This is a safe alternative to those chemical-based sprays that pose danger to both the spiders and the homeowners. This spray is made with vinegar soap and hot sauce, absolutely no toxic chemicals that can harm you. You can also spray this where your kids and pets play, it’s organic so they are in safe hands. This bug spray is easy to use. If you have ever squeezed anything before, you can use this product, just be sure to shake well before spraying. You just need to press the nozzle and out comes the spider eliminator wreaking havoc on those pests. Those that have been doubting the efficacy of natural ingredients in pest control products, this particular one will clear your doubt. But you will have to try it first. If for no other reason, when using this product, you can be happy with yourself that you are not contributing to the degradation of the environment. Since this spray is all-natural with not toxic compound, no harm is done to the atmosphere when you use it. 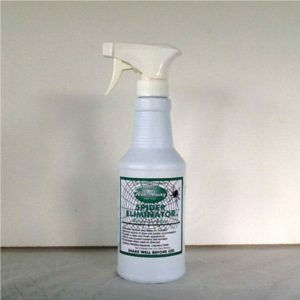 In this vein, you can use this spray on almost anything to prevent spiders from nesting on them; from light fixtures to wall decoration, window sills, around doors, etc. You will know a brand that trusts its products by how much it is willing to use them. Star Brite is one of such brands. The first thing to note about the brand is that it ensures that its first customers are the staff of the company such that if there are any complaints about the product, they are the first to report. And you know that you cannot manufacture a product that will fail if you are going to use the same product. Star Brite’s products range from boat waxes to cleaners to insecticides and varnishes. These products are made with a combination of advanced technology and eco-friendly materials of superior quality. It ensures that every product bearing the Star Brite logo is one of the best of its kind in the market. You can transfer all these attributes to the Star Brite Spider Away Natural Repellent which is made with natural eco-friendly active ingredients – peppermint oil and vinegar. These are your everyday kitchen or household items, so there’s no fear of causing any hazard to the environment. And are you not thrilled with the fact that you don’t have to kill the spiders? You just lovingly and thoughtfully “shoo” them away when you use this repellent in spider-infested areas. What a way to preserve the ecosystem. If you have children and pets around, your concern of poisoning is taken care of with this repellent. The ingredients are non-toxic and can easily be washed off even if your kid or pet comes in contact with it. This repellent can be used on any surface at all, be it vinyl, cement, fiberglass, painted surface, wood or glass. Just be careful not to spray it on plants and flowers as it may be harmful to tender plants – It can be used both outdoors and indoors too. The smell may come off as strong for some people but this simply confirms how fast the spiders will run from it, noting that spiders taste with their feet. A product that comes as strong for humans will be triple worse for arachnids. An application may last for up to 3 to 6 months but this is dependent on the intensity of infestation of your area. Best advice is to always check the area and monitor how often you need to reapply. The surface also determines the frequency of application. If the surface is exposed to rain or water which washes the application off more often, then the frequency of reapplication may be more and vice versa. From the buying guide to the detailed list of 10 awesome products to help you rid your home of spiders, you now have sufficient information to make a confident choice of which product will fully satisfy your needs. The ball is now in your court – Please, take order now and take back your space. Steaming for bed bugs? Is it an efficient way to kill bed bugs?